There are always a couple of films that come out every year that everyone enjoys except for me. Nebraska is definitely one of those. I'd be lying if I said I enjoyed any of Alexander Payne's self-important dialogue-filled, underachieving, landscape-contemplating bore-fests. Nor do I enjoy road movies� Nor do I enjoy black and white in a modern film for no particular reason. So, these reasons alone pretty much evoke a recipe for disliking in me. This pretentious 'let's go on a road-trip out of the blue on a quest to find something of value while at the same time getting to know our inner selves' bulls*it in movies nowadays is getting on my nerves. I can just picture Payne in the director's chair going, 'Oh yeah, the critics are gonna love that'. Every single isolated and yet bloated and wary frame in this film annoyed me, because it just didn't know that it was a continuation of an already tired filmography, namely that of a director who seems to be running out of ideas. The screenplay is just as superficial as the overblown direction, offering absolutely nothing we haven't seen before, even going to the point of letting us imagine personalities for these totally unlikable and illogical characters, played rather lazily by genuinely good actors. The character development is so flimsy and nonexistent, it even starts to show by the end of the first act. The son gets five minutes of so-called development at the beginning, teaching us absolutely nothing about him, and so does the father, whom no one wants to put in a home when he is clearly not in a healthy mental state. I don't mean to be disrespectful to seniors, I just cannot see a valid reason in taking a man in his eighties to Nebraska to collect his prize, which doesn't even exist. Who does that?! And on top, every single scene and move the characters make is predictable. I know I'm sounding very self-indulgent right now, but so was this movie. Okay, enough hating on Payne. But I'm sorry, I just can't grasp the fact that directors nowadays are making diverse films about poverty, animal cruelty, terrorism, charity, integration, love and everything that is important and an issue in our contemporary lives, and Payne is still making the same movie over and over again about people who drive around in cars, stare at landscapes and look out of the f*cking window. The acting, as previously mentioned, was increasingly annoying. None of the comedic lines (if they were even meant to be comedic) landed, the actors have almost nothing to do with such terrible dialogue going on between them and once again, Payne wastes half of his cast, choosing to spend way too much time getting way too close into the faces of the two most uninteresting father and son characters which I may have ever witnessed. Tell me when senile characters' on-screen rants become artistic filmmaking, because I don't think I have fully grasped what is so entirely brilliant about the performances of Bruce Dern and June Squibb. Bob Odenkirk: He was okay. Insert Breaking Bad reference here. 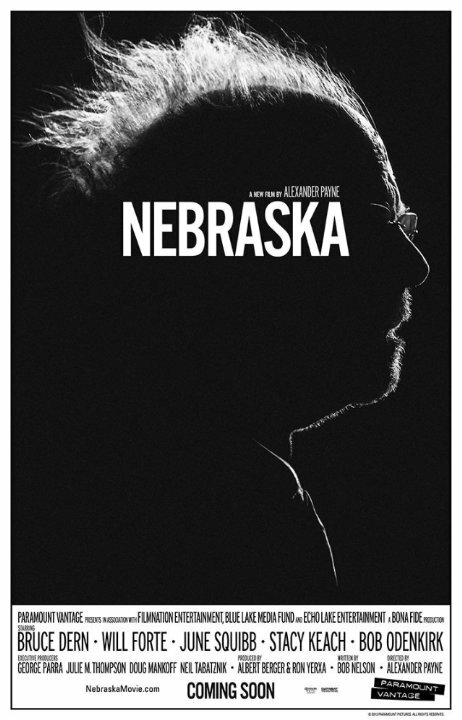 Once again, Alexander Payne's new feature achieved little more emotion than an occasional sigh out of me. This film is a perfect example of make-believe artistry. Of a director trying to desperately impress his audience by having a character look melancholily out of a car window� in black and white! It just shouts creative around every corner!